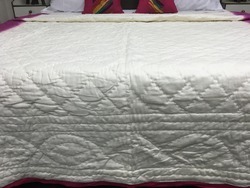 Our company is able to manufacture and supply Personalized Quilts. Emerging company offering Personalized Quilts. We have founded ourselves as a recognized manufacturer of Personalized Quilts. Our organization has gained lot of experience and expertise and has come out with Royal Wedding Quilt. Pastel colors are used with floral embroidery that makes the entire array widely demanded in the market. This wedding quilt is designed by our professionals using the latest machine in tandem with the set industrial norms. We are leading Manufacturer of Customised Quilts and Photo Quilts for Dad. In order to cater the diversified demands of our clients, we have been able to provide a unique range of Modern Printed Quilt. Our company is fully enagaged in personalized quilts. We are able to manufacture Personalized Quilts , with the vast support of our team. We are a emerging Supplier of Personalized Quilts. Leading dealer of Personalized Quilts. We have been able to offer our clients a qualitative range of Personalized Quilts.